Affinity Womens Health LLC (Wilmington) - Book Appointment Online! 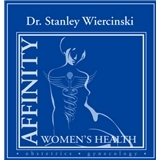 Dr. Stanley Wiercinski has been a leading provider of women's health for over two decades in the Brandywine Valley / Pennsylvania and Delaware areas. With advanced obstetrical and gynecological services, Affinity Women's Health is equipped to facilitate procedures such as routine and high risk pregnancies, treatment for urinary incontinence, laparoscopic surgeries, endometrial ablations, and sterilizations. Great beside manner, gentle and overall very pleasant. 5 Star service and I would highly recommend! When I was on my way into the visit, another patient made it her business to tell me all of the above!